I’d wager that the reason the Berkshire Hathaway web site is as ugly as it is is because Warren Buffett doesn’t see a reason to change it. I’d also guess that it remains in its current form because it exemplifies Buffett’s outlook on spending — which is to be conservative with money. The design leaves a lot to be desired, but you must admit it gets the job done. The site is usable. I can find the annual report, or the GEICO affiliate link for goodness sake. I have been thinking about this for a few days and something about it really irks me. It is that design doesn’t need to be expensive. My guess is that Buffett wants his investors to perceive the company as thrifty. By leaving the site as it is, and publishing annual reports without a thought given to the design he most likely achieves this goal. But does he accomplish one purpose and miss another? Does the Berkshire Hathaway brand suffer because of a lack of design or does it succeed without it? I believe that a good designer could give the Berkshire Hathaway brand some incredible design weight while holding to the values Buffett wants to convey. This post was originally inspired by a post on Hacker News about this topic. 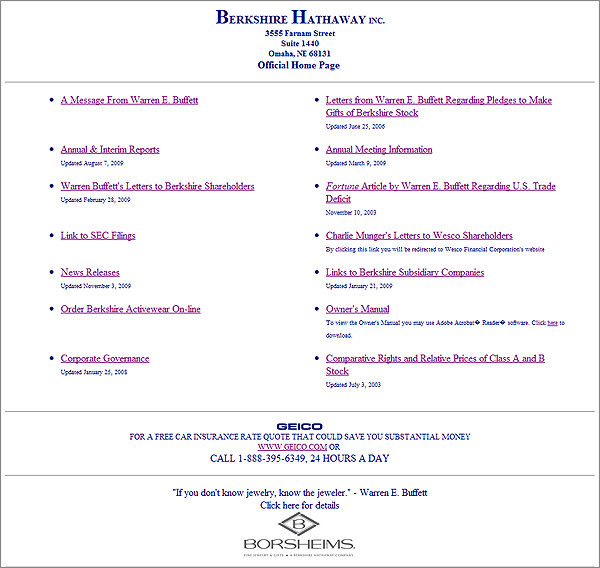 It’s pretty obvious from the design of the Berkshire Hathaway website that their site is not intended to sell their company to anyone. The power of their brand lies not in design or graphics or even in their website but in the person and portfolio of Buffett. His brand doesn’t need pleasing aesthetics. They’ve got him. Now if you’re a money manager looking to attract investors and don’t have the cred of some one like Buffet, you better start thinking about the look and feel of your brand. And probably hiring a professional to help you through that process may be your next smart decision. Mike, I agree but that’s not a good enough excuse to not market. That’s like saying the Apple brand is in Steve Jobs and it doesn’t matter what the Apple site looks like.